The Iowa Barnstormers (0-0) look to improve in this year’s 2011 campaign as they compete in the Arena Football League for the second consecutive year since rejoining the league in 2010. 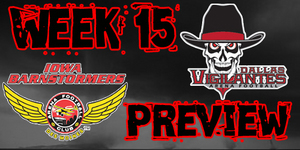 The Barnstormers open their season on the road against the Pittsburg Power (0-1), Saturday March 19th at 7:30pm EST. Not much is known about the Power as they enter their first season with the AFL. The newly expansion team, led by former Pittsburg Steelers and NFL Hall of Famer Lynn Swann, lost their first contest against the Philadelphia Soul by only 6 points last week. The Power’s roster, although inexperienced in the AFL, will bring a team of young talent to the field at this Saturday’s game. There will be many newcomers on the Barnstormer’s roster this year with only 10 players returning from last year’s squad. This year the ‘Stormers seek leadership on the field as they aspire to fill the quarterback position with a new face. The 2010 starting quarterback, Ryan Vena, will be making his mark with the Philadelphia Soul this year, leaving the QB position up for grabs. After two strong performances in the Barnstormer’s exhibition game on March 3, fans are excited to see who Coach Gregory chooses to fill the void in this Saturday’s match up. The toss up will be between Bryan Lee-Lauduski (6-4, 210, Southern Oregon University) and Brad Banks (6-0, 212, University of Iowa). Jesse Schmidt-Barnstormer’s leading receiver last year and ranked 7th in the league for total receiving yards with 1,621. Schmidt averaged 14 yards per reception and over 100 yards per game, scoring 28 touchdowns, tying for 13th in the league. Schmidt was named Catch of the Week 4 times during the 2010 season and once for Ironman of the Game and Offensive Player of the Week. Todd Blythe-2nd leading receiver last year recording 65 catches for 826 yards and 22 touchdowns, averaging 12.5 yards per reception. Blythe was nominated for Ironman, Offensive Player and twice for Catch of the Week. Rodney Filer-Ranked 6th in the league last year for total rushing yards with 187 total yards. Filer finished the 2010 season with 51 rushes and 8 touchdowns. He averaged 15 yards per game with 6 catches for 35 yards. Ryan Vena-Ranked 3rd in league last year for total rushing yards with 275 for 22 touchdowns. Vena completed 318-of-499 passes for 3,964 yards and tallied 78 touchdowns. He will be continuing his career this year with the Philadelphia Soul. Tanner Varner-Led the league last year in total tackles with 146. Varner will be continuing his career this year with the Philadelphia Soul. Jason Simpson-Ranked 5th in league for total tackles with 106. Simpson will be continuing his career this year with the Chicago Rush. Brent Curvey-A 2-year veteran for the Barnstormers, Brent “Big Play” Curvey returns for a third season. Curvey has tallied 49 tackles in his 2-year reign as a ‘Stormer and is expected to increase that number. Known for making game-changing plays in his years at Iowa State, “Big Play” will add power and strength to the D-Line this season. DeMarcus Granger (6-3, 320)-This former Sooner standout joins the Barnstormer’s defensive line in his first debut in the AFL with experience from the Seattle Seahawks. Not only will Granger bring good size to the defense but also quickness which has enabled him to be one of the top rated defensive line prospects in the country based on tackles.